Bard on the Brain is an odd book. At first glance, the subject matter is too broad to make coherent. It proposes to discuss both Shakespeare and brain scans in the same context. But it works. Shakespeare was an amazingly incisive observer of psychology. And brain scans, colorful, yet hard to interpret as they are, are at an interface between science and art. The book proposes to aid in "understanding the mind through the art of Shakespeare and the science of brain imaging." Each chapter opens with a short discussion of an aspect of human psychology, followed by a passage from one of Shakespeare's plays. Then the passage is probed to show how it explores the psychological topic being discussed. Finally the discussion turns to what brain imaging techniques reveal about that same topic. Shakespeare offers a very broad perspective; one from which the scientific details of brain function are not needed. This broad view then becomes the context within which the detail of the brain scans may be considered. This is important because the brain scans are at a level where "You can't see the forest for the trees." In many ways this is an eye-opening book. For this reviewer it provided a bracing re-introduction to the Bard. And, even in this scientific age it easy to miss the amazing accomplishments of our research establishments. The structure of the book causes some difficulties. The reader is presented with a series of passages and images ripped out of context. This leads to a certain disjointedness overall. This applies most strikingly to the brain scans; we see an enigmatic series of brains with patches of color, organized with an eye to design. But even with extensive captions, the brain scans were not particularly illuminating. 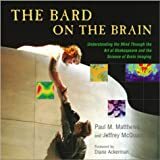 The idea of writing a book that incorporates both the Bard and brain scans in one volume presents a considerable creative challenge; a challenge that Bard on the Brain has successfully met. But any book about science and knowledge also must meet another challenge; is it useful to the reader? It depends on the reader of course. The reader looking for a list of interesting passages and amazing accomplishments will be impressed with Bard on the Brain. The reader seeking new insights and an advance to understanding may be disappointed.